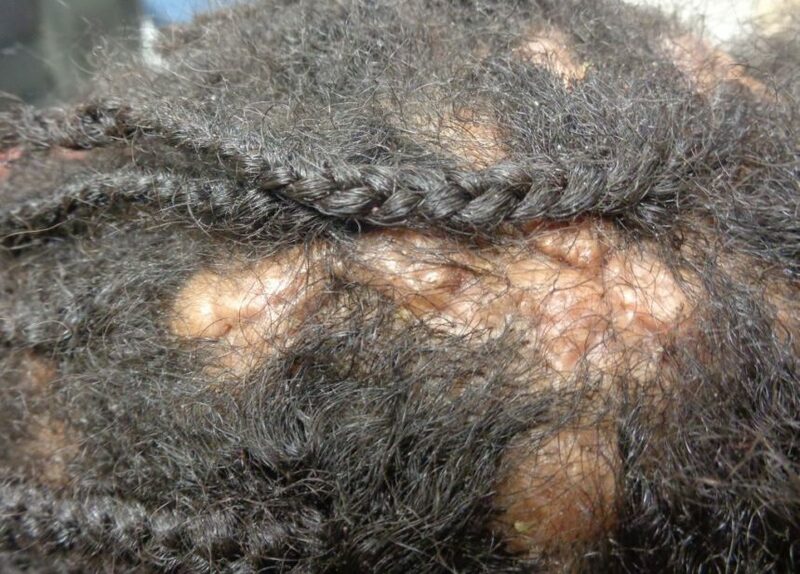 The patient is a 27-year-old African American man requesting treatment for a chronic scalp condition that has not responded to multiple courses of antibiotics. The disorder is painful and has resulted in hair loss. Noted are scattered nodules and sinus tracks. His face and trunk manifest occasional acneiform papules. Adequate control of DC is challenging. Scalp cleansing with chlorhexidine or benzoyl peroxide is encouraged. Mild or early disease may respond to topical and oral antibiotics.1 For worsening DC, isotretinoin is often considered as first-line treatment, with doses ranging between 0.5 and 1 mg/kg/d for 3 months to 1 year.2 For advanced unremitting disease, laser depilation, tumor necrosis factor alpha blockers, or localized scalp excisions are treatment options. 1. Taylor S, Badreshia-Bansal S, Callender V, Gathers R, Rodriguez D. Treatments for Skin of Color E-Book: Expert Consult-Online and Print. United Kingdom, Elsevier Health Sciences; 2011:236-237. 2. Cataldo-Cerda, K., Wortsman, X. Dissecting cellulitis of the scalp early diagnosed by color Doppler ultrasound. Int J Trichology. 2017; 9(4):147-148. 3. Tchernev, G. Folliculitis et perifolliculitis capitis abscedens et suffodiens controlled with a combination therapy: Systemic antibiosis (metronidazole plus clindamycin), dermatosurgical approach, and high-dose isotretinoin. Indian J Dermatol. 2011;56(3):318-320. 4. Calonje JE, Brenn T, Lazar A, McKee P. McKee’s Pathology of the Skin. United Kingdom: Elsevier Health Sciences; 2011:1027.